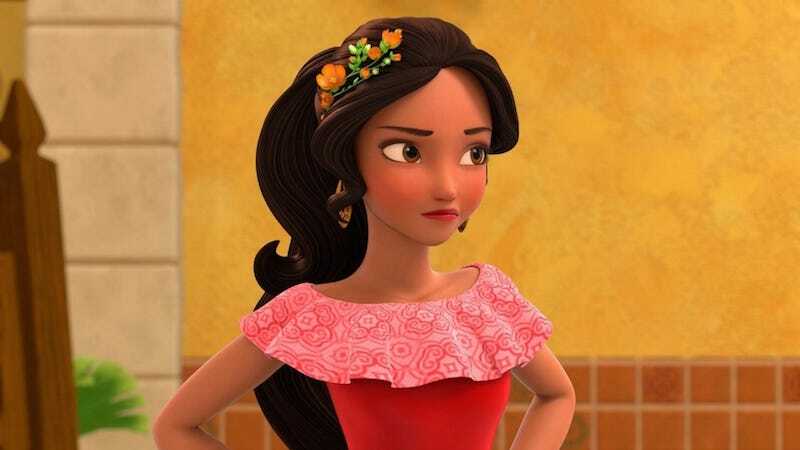 At long last, Disney has created a Latina princess to join its pantheon of (predominately white) royalty: Elena of Avalor. She’ll make her debut not in a feature length film, but via a new television series on the Disney Channel. Elena’s narrative renders her a powerful political figure at the young age of 16. Orphaned as a teenager, she endeavors to lead her kingdom, repossessing it after it has been captured by an evil sorceress. But Disney knows it must tread carefully; its portrayals of people of color are often regarded as caricatures. In an effort to stave off criticism, the kingdom of Avalor features Aztec-inspired architecture, and the 22-minute episodes will draw heavily from Latin folklore. The show will also introduce a host of original music, influenced by Chilean hip-hop, salsa, and mariachi. And, as the New York Times reports, Elena of Avalor merchandise will line store shelves by July 22, when the show premieres. Disney will also integrate Elena’s character into their theme parks. “It’s not a secret that the Hispanic and Latino communities have been waiting and hoping and looking forward to our introduction of a princess that reflected their culture,” Disney executive Nancy Kanter told the Times. Kanter is overseeing the new series. “We wanted to do it right,” she added. Some question why Elena appears on the small screen, rather than in theaters, when films bring more clout and exposure. Mandy Velez, co-founder of Revelist, tells the Times, “It really seems like a shun.” But in an interview, Aimee Carrero, who voices Elena, “said it means ‘absolutely everything’ for her to play the first Latina princess,” ABC News reports. Image via Disney. Video via YouTube.